CR Pro Series - This Pro Series Phase Converter manufactured in the USA by American Rotary is built using longstanding, reliable electromechanical controls designed for Phase Converter use, and used continuously by American Rotary for over two decades. UL/CUL Listed. The CR series provides utility grade power can power virtually any 3-phase equipment. Best for: Light to medium duty, general purpose loads. Power an entire shop with 3-phase. Reliable & convenient alternative to utility 3-Phase. Download the installation manual HERE! Meeting the demands of tough industrial applications with dependability & quality. 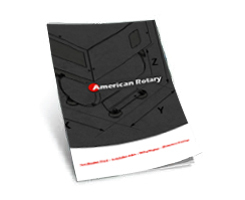 American Rotary has become a trusted name in the industrial Power Industry.